Altacor is a new insecticide registered in cranberries. 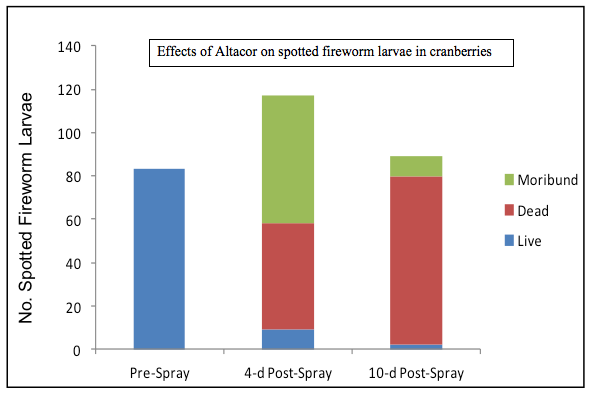 A few weeks ago we conducted an experiment to test the efficacy of Altacor® (DuPont) at 4.5 oz/acre against spotted fireworm larvae. The experiment was conducted in a commercial cranberry bog in Chatsworth NJ. The application was done aerially on Monday May 27 following grower standard procedures. A pre-spray count of larvae was conducted on Thursday May 23. Post-spray counts were conducted on Friday May 31 (4 DAT) and on Thursday June 6 (10 DAT). Samples were taken using a sweep net (6 sets of 25 sweeps each) (see picture). We found very high numbers of spotted fireworm larvae in our pre-spray samples (average of 15 larvae per sweep set) (see graph). Four days after the Altacor treatment, most larvae were moribund. After 10 days, 88% of the larvae were dead (only 2% were alive and the rest were moribund) (see graph). Altacor is a new insecticide registered in cranberries. Its active ingredient, Rynaxypyr®, is from a whole new group of chemistry (Group 28) with no cross-resistance to other chemistries. Altacor is effective against lepidopteran pests including gypsy moth, leafrollers, spanworms, fireworms, and fruitworms. It controls hatching insects all the way through to adult stages of development and is easy on bees and beneficial insects. Unlike other insecticides, Altacor controls caterpillars by acting on their muscle fibers. It exhibits rapid cessation of feeding, lethargy, regurgitation and muscle paralysis, ultimately leading to death. In our study, we saw that 4 DAT most spotted fireworm larvae were not dead but looked lethargic (moribund); however, 10 DAT most of these larvae were dead. These results are in line with Altacor’s mode of action.